I. Many people will not, of their own accord, look at a poem. II. Millions of people will, of their own accord, spend lots and lots of time looking at photographs of cats. III. Therefore, earlier this year, I concluded that the best strategy for increasing the number of viewers for poems would be to print them on top of photographs of cats. IV. I happen to like looking at both poems and cats. V. So this is, for me, a win-win situation. VI. Fortunately, my own cat is a patient model, and (if I am to be believed) quite photogenic. VII. The aforementioned cat is Tisko Tansi, small hero. VII. Thus I present to you (albeit in digital rather than physical form) an Endearments broadside, featuring a poem that originally appeared in BlazeVOX spring 2011. VIII. If you want to share a copy of this image, please ask first. If you want a real copy, you can ask about that too. If I could think of the poems as objects, I said to a friend, a visual artist, this past spring, they would take up as much room as objects do in my mind, and then I would need fewer things in my life. Fewer artifacts waiting to become art. After it’s had the chance to live online a while, affix your poem to a page. One you can give out, or barter for snacks or a drink, or sell for a few bucks. . . . And if you are one of the fine folks who are doing something like this already, for your own work or for that of others, in your living room or in a letterpress studio, I applaud you. Don’t stop. . . .
Make it. Allow it to exist in time, and try again. And try new things, and get better. It’s easier to get away with such imperatives if you’ve followed your own advice. In the case of poetic objects, though, the physical evidence necessarily has a smaller audience than the html-encoded call to action. So I am offering a partial fix. 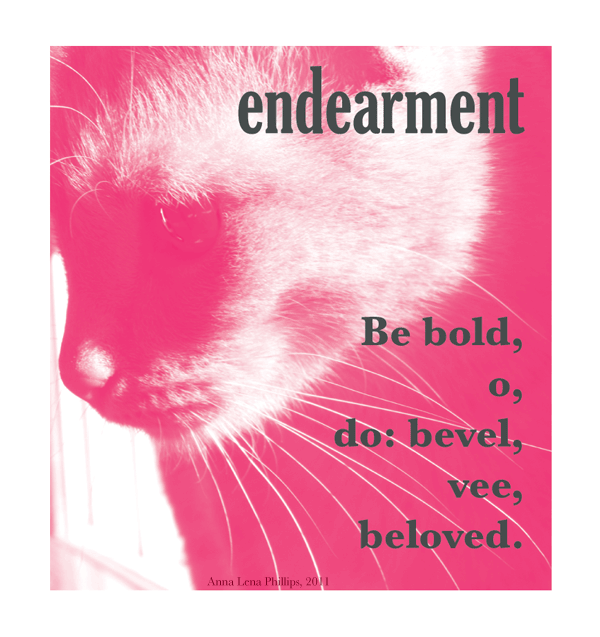 Shortly I’ll post the digital iteration of a broadside I made of the “beloved” endearment. I printed it on pale grey, textured paper, and I handed it out at the 2011 West Chester University poetry conference. Now it will live here too, but it is better in person. “Well,” said E. . . .